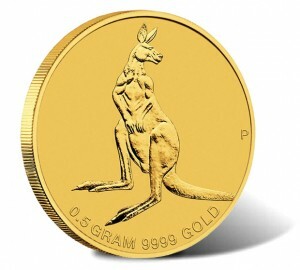 The Mini Roo also offers the opportunity for collectors to obtain a coin struck from a precious metal as this release has a composition of 99.99% pure gold. The coin is available now for AUS $59.50 with no pre-determined mintage cap in place. 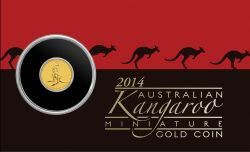 Mini Roo Gold Coins made their debut from the Perth Mint in 2010. Since then, they have been issued annually with each new release featuring a different reverse image of a kangaroo. The 2014 Mini Roo shows an adult koala standing in a classic stance and looking over its left shoulder. Inscriptions below the design read 0.5 GRAM 9999 GOLD with the Perth Mint's historic 'P' mintmark to the right. A portrait of Queen Elizabeth II by Ian Rank-Broadley is struck on the obverse. Inscriptions surrounding the portrait include ELIZABETH II, AUSTRALIA, 2014 and the legal tender face value of 1 DOLLAR. 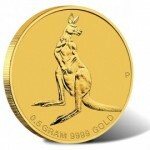 Each 0.5 gram gold coin is considered "button-sized" with a diameter of 11.60 mm. Maximum thickness is listed as 0.70 mm. The gold content of each is 0.016 troy ounces. The Perth Mint encapsulated each Mini Roo and attaches it to a colorful wallet-sized card.